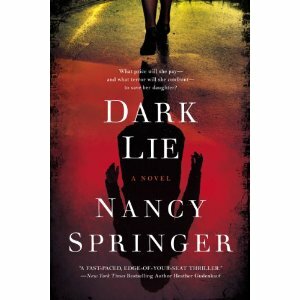 Long and Short Reviews welcomes Nancy Springer, whose Dark Lies is coming out next month. 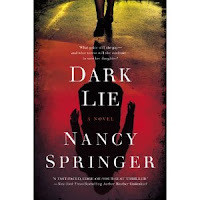 Nancy is giving away ten signed uncorrected proofs of Dark Lies to randomly drawn commenters. Nancy has been writing for forty years and Dark Lies is her fifty-fifth published novel. She also has many that have gone unpublished. "I haven't kept track of that number—perhaps twenty?—because I seldom think about them. I mention them now lest anyone think once you're published you're 'in.' It's not so. Every new novel is as risky as the first," she told me. She was an English Literature major in college and thought she would "fulfill the manifest destiny of the English Literature major, which is to propogate their own kind." She planned to take a Master's degree and teach in a college or university. However, she got married and her husband's plans changed hers and she found herself living the life of a housewife. "Dialogues and daydreams filled my mind, so I tried to kill time by writing -- but what? The Great American Novel? I felt no authority. In college I had studied Chaucer, Shakespeare, Milton, Joseph Conrad, Hemingway, Steinbeck and so on and on -- not a single female novelist except Jane Austen," she told me. "The only thing women wrote, obviously, was romance, and everybody knew that was pulp. (Wrong! But that realization came later.) I got no farther than thinking about writing contemporary fiction; I kept running into a nameless and invisible wall. Finally, after several months, it occurred to me that if I were to attempt a fantasy novel somewhat like the works of J.R.R. Tolkien, at least no critic could tell me I had my facts all wrong. So my first published books were mythic fantasy -- ten of them in a row before I started to branch out into other genres." She didn't immediately think of herself as an author, however. It wasn't until after she had published her first book, written a couple more, retained a literary agent, and signed a nice publishing contract. "Not, in fact, until the morning I told my husband that, starting that day, I would put my writing first and housework second," she remembered. "I don't remember the date. I should have marked it on my calendar to celebrate on a yearly basis. That may have been the day I saved my own life." Until that time, she was a "capital-W Wife" in a very traditional marriage, with two preschool children, no job, and no car she could use. "We lived way out in the country. I raised a vegetable garden; I made my own clothes and those of my children; I cooked inexpensive, labor-intensive meals because we had no money; I did the dishes and the laundry and housecleaning; I played with my children and read to them, and only when I was doing that last thing did I not feel like hell," she admitted. "To help the miserable days pass, I daydreamed, keeping a typewriter set up (this was before word processors) and every once in a while I stole a few minutes from my 'duties' to type a few lines, sometimes a whole paragraph. Even after I was published, I was still a housewife who wrote as a hobby." She doesn't remember what it was that gave her the courage to say she was going to write every morning for an hour or two before she made the beds, but she did—and went from being a depressed housewife to being a writer with her whole life ahead of her. "What is your writing space like?" I wondered.
" This is a hoot. At first, circa 1972, my writing space was just spiral-bound notebook in my lap. When I had handwritten the first novel, I needed to type it (original and two carbons) but I didn't own a typewriter and we couldn't afford to buy one, so I offered to be church secretary in order to gain custody of an old Royal. It, along with a ream of paper, resided on a folding card table in one corner of my bedroom, right next to the bathroom. We moved to another parsonage (Yep, that's why we were poor as church mice. My ever-so-traditional husband was a pastor.) and there was no room for a writing space for me in the bedroom or any other room so I managed to set up a tiny desk in the hallway outside the bathroom. By now I had inherited my older brother's portable Olympia typewriter, small enough to fit the space, and my husband hung a shelf on the wall so I could keep a few reference books within reach. I also taped papers to the wall -- character names, words I habitually misspelled, that sort of thing. At the next parsonage, upstairs by the bathroom (of course) was the pastor's study, complete with cabinets, shelves, and a desk. My husband didn't want parishioners upstairs, so he set up his office downstairs, and I got the other one. To separate the room into my office and a playroom for the children, we put up a corkboard 'wall,' and wow, I ran amok tacking up maps and pictures of my imaginary worlds, filling the bookshelves, writing as long as I wanted while listening to my children totally trashing their play space. And for the first time I had money enough to buy a typewriter. An electric one. It was the money from my writing that enabled my husband to quit the ministry, at which point, of course, we had to move out of the parsonage. It was the money from my writing that paid for the house we would live in while he started some kind of new career. The house was a tall, narrow "Vernacular Victorian" rather like a file cabinet. All of those old houses had an interesting floor plan upstairs -- a front bedroom right at the top of the stairs, a back bedroom that had been divided to install an indoor bath (claw-footed tub), and the room in between, which had no doors. It seems the boys were put in the front room with easy access to downstairs, but the girls were put in the back room, where they could not get out of the house at night without walking right past their parents' bed. Anyway, the room with no doors became my office. Right outside the bathroom, as was becoming traditional. Another tradition was that I never put a clock in my office. The office was an area apart from time. Because we were no longer living in a parsonage, I could undertake the previously unthinkable, such as tearing up the threadbare carpet, plus patching the cracked walls and painting them the color of my choice! I chose peach, and when it turned out a bit bright, sponge-painted it with a lighter shade -- beautiful. Plus a wallpaper border at the top. Plus a big bookshelf set up as a kind of room divider, books on one side and my desk on the other. I used the back of the bookshelf as the surface on which to tape my lists, my pictures, all my visual aids, including a complicated guide to WordStar, the writing program on my new computer. The desk had a special place for me to set my dot-matrix printer so that the fan-folded paper would flow down onto its own little shelf. I could print out a whole novel in less than a week! After a while I got a daisy wheel printer. After another while, my husband left the marriage just as abruptly as he had left the ministry. After that I no longer felt so fond of my office, and I bought a laptop I could not afford and took to writing in restaurants. But now I have a new husband, a new residence, and a new office that I like very much. It's in what might have been meant as a nursery, a bedroom too small for a bed, right next to the bathroom of course. As I write this, there's a pink crepe myrtle bush in full bloom outside my window. Beyond are the towering longleaf pines native to the Florida panhandle. I look up at them every time a hummingbird or butterfly passes by. As I type, Mayzie cat rests her chin on my left hand; she likes the feel of my knuckles working against her throat. In the half of the window that's not over the computer I have hung a corkboard so I can tack stuff up, but very little of it has anything to do with business. It's pictures, mostly. Above some low bookshelves I've arranged more pictures on the wall with poster putty -- horses by Marc, a wonderful purple cow print, some silly pix I made myself with crayon and stickers. Behind me is a wall so scarred up it deserved to be covered -- with a cloth shower curtain featuring the original E.H. Shepard Winnie-the-Pooh illustrations. Boxes of foreign editions are stacked in front of it. I hear wind chimes; I've hung them all along the eaves, and I always make sure that the one I can see from my office window is the prettiest. I'm drinking Diet Pepsi out of a huge cup with Matisse-cut-paper-style tulips on it. Five plastic horses prance on the windowsill right above my laptop. Offices don't get much better than this." Nancy Springer has passed the fifty-book milestone, having written that many novels for adults, young adults and children, in genres including mythic fantasy, contemporary fiction, magical realism, horror, and mystery -- although she did not realize she wrote mystery until she won the Edgar Allan Poe Award from the Mystery Writers of America two years in succession. DARK LIE is her first venture into mass-market psychological suspense. Born in Livingston, New Jersey, Nancy Springer moved with her family to Gettysburg, of Civil War fame, when she was thirteen. She spent the next forty-six years in Pennsylvania, raising two children (Jonathan, now 35, and Nora, 31), writing, horseback riding, fishing, and birdwatching. In 2007 she surprised her friends and herself by moving with her second husband to an isolated area of the Florida panhandle, where the birdwatching is spectacular and where, when fishing, she occasionally catches an alligator. To their neighbors, Dorrie and Sam Clark seem a contented couple in America's heartland, with steady jobs, a suburban home, and community activities to keep them busy. But they're not quite what they appear to be. For plain, hard-working Sam hides a depth of devotion for his wife that no one would suspect. And Dorrie is living a dark lie -- beset by physical ailments, alone within herself, and unknown to those around her, following the comings and goings of the sixteen-year-old daughter, Juliet, she gave up for adoption when she was hardly more than a child herself. Then one day at the mall, Dorrie, horror-stricken, sees Juliet being abducted, forced into a van that drives away. Instinctively, Dorrie sends her own car speeding after them -- an act of reckless courage that pits her against a clever, depraved killer, and draws Sam into a dogged, desperate search to save his wife. In a confrontation that unites mother and daughter in a terrifying struggle to survive, Dorrie must face and conquer her own secret, tormented past. Congrats on 55 books. That is amazing. Congrats on 55 books. What an accomplishment. I like that you kept writing. Congratulations on all the stories you have written, both published and unpublished. That's a wonderful accomplishment! Wow, I didn't know you'd written so many books. That's incredible!